You are currently browsing the Gluten Free For Good blog archives for November, 2008. Here I go again, rushing to publish my seasonal foods list for November before December takes over. I’ve been putting it off as I don’t want to be reminded that my weekly CSA delivery of locally grown produce is about to come to an abrupt stop. I don’t even want to think about it. Seriously. 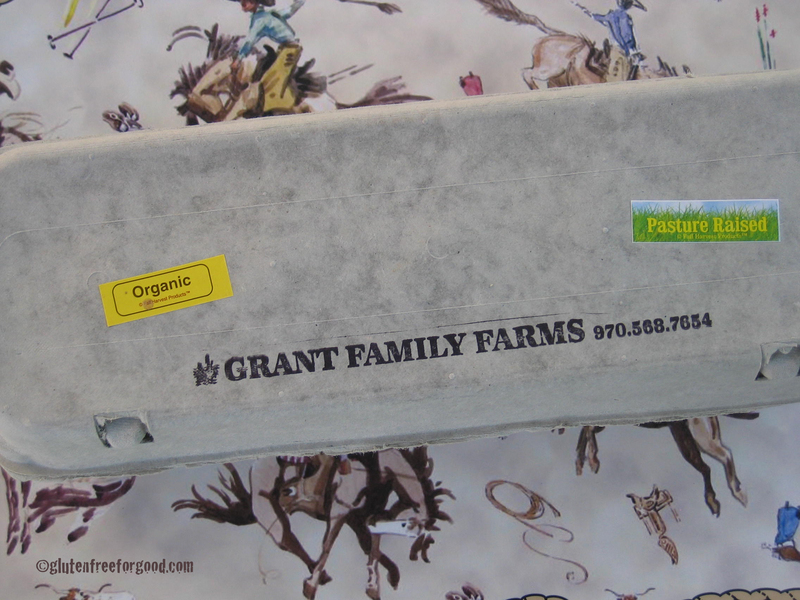 Those of you who have been following my blog for the last 24 weeks know how much I love having my big red tub of Grant Family Farms seasonal fruits and veggies delivered every Thursday. I have two more weeks left and then I will be in mourning. Deep, dark mourning. In the meantime, I’ll get right to the point. No whining or complaining as this is supposed to be a time of expressing gratitude. No feeling sorry for myself. At least not openly. Well, maybe a little bit. Sniff, sniff. Cranberries — are a rich source of dietary fiber and vitamin C. High in antioxidants, they are also thought to protect against urinary tract infections and prevent kidney stones. Cranberries also help promote gastrointestinal health and protect against cardiovascular disease. Winter Squash — there are lots of varieties of winter squash, including acorn, kabocha, butternut, Hubbard and even pumpkin. Each one is an excellent source of vitamins A and C and most are also rich in dietary fiber, potassium, and folate. 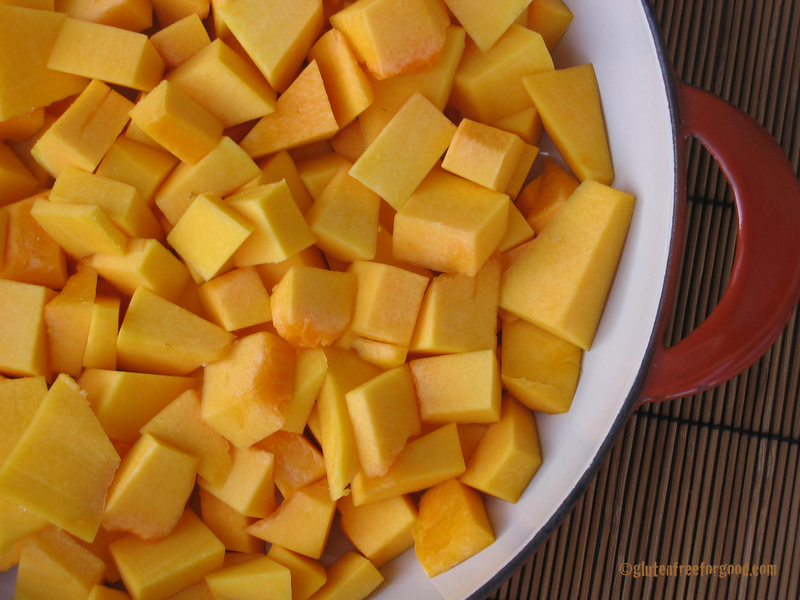 Winter squash also provide anti-inflammatory protection, so enjoy often! Sweet Potatoes — are available year round, but November and December are peak harvest times. You can get 265% of your daily value of vitamin A in one small sweet potato! And for only 95 calories. They are also high in vitamin C, manganese, fiber, B6, potassium and iron. Don’t save sweet potatoes just for Thanksgiving, eat them year round. They are over-the-top healthy. There’s no right or wrong way to make soup. The whole point of soup is to use what you have on hand. Play with the ingredients and try different combinations. 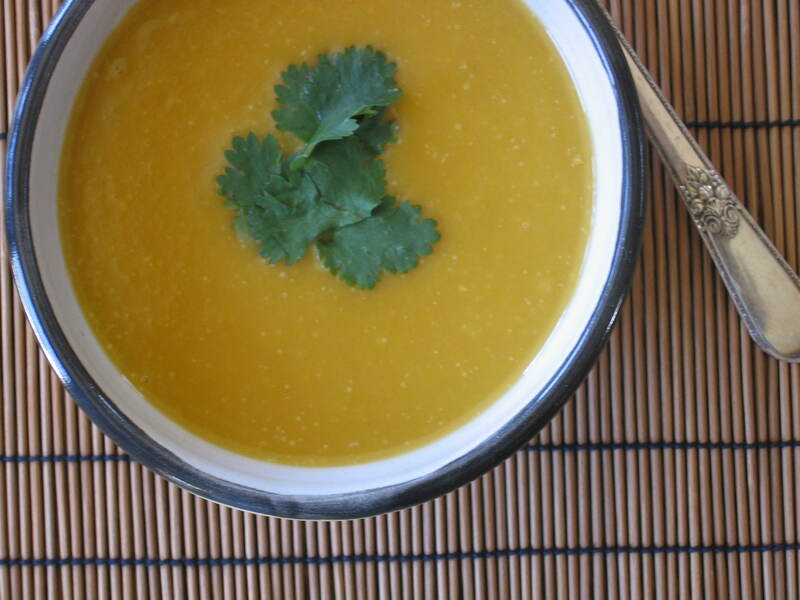 Other seasonings to try in sweet potato soup include 1 teaspoon of mild Indian curry paste, 1/2 teaspoon of red pepper flakes, a pinch of cayenne or turmeric. • Sauté onions in oil or butter in large soup pot over medium heat until lightly browned. • Add minced ginger, cumin, coriander, or whatever spices you’re using. Stir and cook until fragrant (about 1 minute). • Add chicken broth, coconut milk, sweet potatoes, and carrots. Bring to a light boil, turn heat down to a simmer, cover and cook until veggies are tender and can be easily pierced with a fork (about 30 minutes). • Remove from heat and let cool for 10 minutes or so. Puree with a handheld immersion blender or puree in batches in a regular blender. Be REALLY careful if you use a conventional blender as the hot soup can blow the top of the blender off. Trust me, it’s not a pleasant experience. Pour back into soup pan and warm thoroughly. Go forth and make soup! No rants this time. Just a simple recipe for a healthy side dish. As those of you who follow this blog know, I’m totally enamored with my Grant Family Farms CSA delivery. The realization that my 26 weeks of local, organic produce is about to come to a screeching halt, is slowly sinking in. In another 19 days I will be in full-fledged mourning. Weeping and wearing black; my pockets and purse filled with chicken, vegetable, and fruit milagros. I may be totally incapacitated. Just thought I’d warn you in case my blog is suddenly silent. In the meantime, I will rejoice in eating my dwindling supply of fresh veggies. I’m not a big fan of boiling the daylights out of my food and have found that a light steaming followed by a quick roasting is a perfect way to prepare broccoli and cauliflower. I’ve been receiving a lot of both of these gems lately. You know, in my-reason-to-live CSA delivery box that is about to come to an end (sniff, sniff). 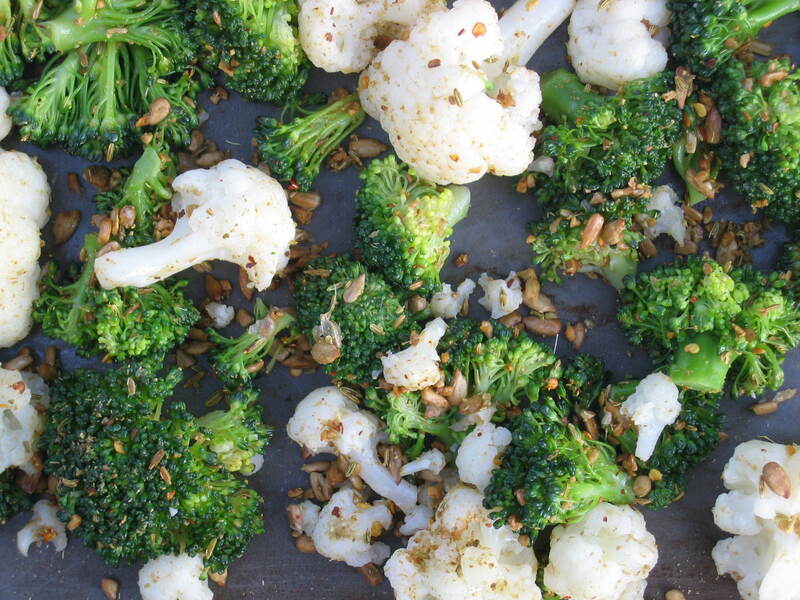 Back to the broccoli and cauliflower recipe. 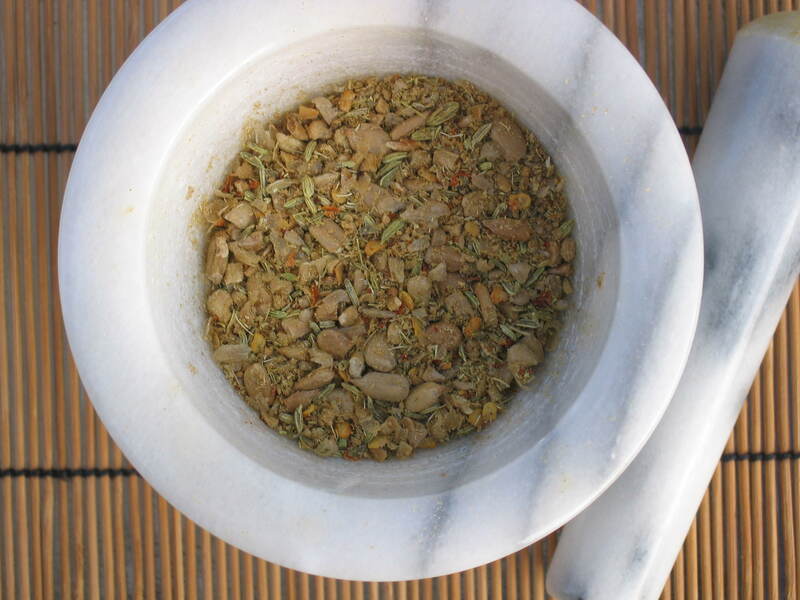 Jamie Oliver, who is one of my favorite chefs, has encouraged me to use a mortar and pestle to mush up my spices and I find this works perfect for this dish. Okay, he hasn’t encouraged me personally, but he does this all the time and I have taken a liking to the process. I now have several mortar sizes and use them for all kinds of things. My dear friend, Miles, who is also a famous English chef uses lots of interesting spices as well. Okay, so Miles doesn’t know we’re dear friends, but he does have a very entertaining blog and has inspired me to use more exotic herbs and spices. Well, not me personally, but his readers in general. In fact, I have some recently purchased fenugreek seeds and cardamon pods sitting right here on my desk waiting for Miles to come to the rescue. He was the reason I bought them and all I’ve done so far is sniff them periodically. Oh my gosh, they smell so good. Especially the cardamon pods. Actually, it’s a toss-up (I just sniffed them both again). I’m addicted. Well, if so, I’m sorry and sad and it’s not my fault. Go forth and sniff your spices. Whew, all is not lost. Every day, nearly eight million people “dine” at a KFC “restaurant” (formerly known as Kentucky Fried Chicken). Every single day! In this case, I’m using the words dine and restaurant loosely. There are more than 11,000 KFCs in more than 80 countries and territories around the world. Ugh! 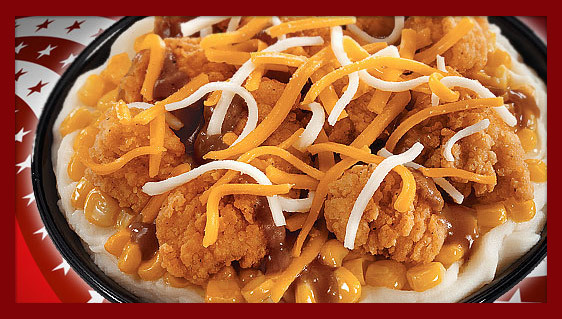 It’s bad enough that we eat this stuff, but I also cringe to see our unhealthy fast-food obsession creeping into countries that consider preparing meals and gathering together to enjoy them an important part of their culture. 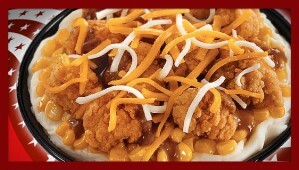 The KFC website has links to hundreds of foreign franchises. “Finger lickin’ good” just doesn’t sound right spoken in French. * And addresses like Nantes St. Herblain, 6 rue des Cochardieres should not be connected with an American fast food franchise. French words go with fine wine and gourmet fare, not soda pop and junk food. Talk about a cultural train wreck. Although I haven’t read the book, French Women Don’t Get Fat: The Secret of Eating For Pleasure by Mireille Guiliano, I have spent time in France and know that the French take pleasure in eating. Meals take time to prepare, fresh ingredients are used, and people eat slowly and enjoy the food and each other. They put their forks down and talk in between bites. Meals are not made ahead, kept warm under heat lamps, or served in plastic wrap. Food is not tossed at them through drive-up windows. They eat real food and savor each bite. And in general (in general), they aren’t overweight and don’t suffer from poor health at the same levels Americans do. Unfortunately, that is changing. With places like KFC on the rise in France, Mireille’s next book might be entitled, Uh-oh, French Women Do Get Fat: And End Up With Diabetes And Heart Disease. We just spent the past several months listening to our presidential candidates talk about rising health care costs and how obesity and chronic disease has reached epidemic proportions. Everyone argued about energy independence, the economy, the health care crisis, and the environment, but no one brought up the food industry as part of the problem. What we eat, where it comes from, how much it costs, how it ends up in our grocery carts or on our plates, how it impacts our health, and what the government chooses to subsidize (or not and why) is a major part of this convoluted equation. Our industrialization of food impacts public (and foreign) policy, but no one seems to connect those dots. Okay, I’ll stick to my nutritional roots and resist launching into a political rant, but I will suggest we support our local farmers and ranchers and eat a rich variety of wholesome foods. It is healthier for us, healthier for the animals, healthier for the economy, and healthier for the environment. If you’d like more information on these subjects, check the links I’ve provided below. In the meantime, I’ll get back to my intention with this blog — healthy eating and healthy living. 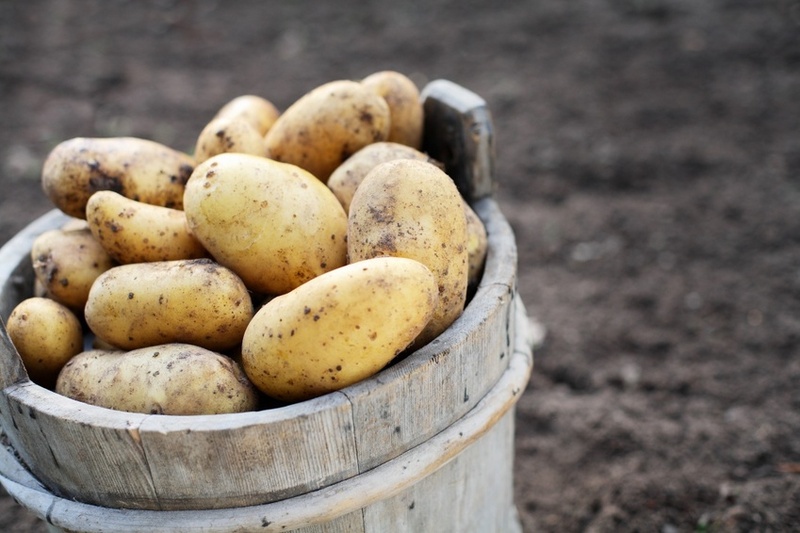 Last week I received a load of Yukon Gold potatoes in my Grant Family Farms CSA delivery and I thought I’d put together a compare and contrast menu for you on how potatoes can be a healthy vegetable choice or an artery clogging bowl of slop. • Put the potatoes in a large pot and cover with water. Bring to a medium boil and cook until tender (20 to 25 minutes). Potatoes are done when you can pierce them easily with a fork. • Drain well, return to pot, and mash them to desired consistency. You can also prepare them in a mixing bowl. • Put milk, butter, and syrup in small saucepan and heat until butter is melted and milk is warm. Stir gently until well blended. Don’t let this burn, it can happen fast. • Stir or mix in the milk/butter/syrup mixture and the salt and pepper until well combined. • Get in your car and drive to one of the 11,000 KFC franchises. • Drive forward 25 feet, idle your car and wait. • When attendant opens the drive-through window, be prepared to catch food as he/she tosses bag to you. • After attendant closes window, realize you have no cheap plastic utensils to eat with. • Wave frantically to get the attention of the teenaged attendant who is ignoring you. • When 16 year old attendant finally opens the window, sighs, and sputters with disdain, “Like, what do you, like, want now?” — answer nicely that you’d like utensils so you can eat your food. • When he/she rolls his/her eyes and tosses you a plastic fork wrapped in a paper napkin and covered with plastic wrap, breathe deeply and practice kindness. • Either eat while driving en-route to wherever you’re going, spilling food on your clothes and endangering yourself and others, or bring home and eat in front of the TV while watching Cops or America’s Most Wanted. • Feel stressed, bloated, and icky. Eat 2 Tums. Hey, no one’s perfect. We can all relate to participating in some version of this, but we also know we’d be much better off eating fresh, wholesome food while relaxing and enjoying it. Plus, it takes no longer to make up a bowl of roasted veggies or cook up some rice than it does to order and eat fast food. * My header (lechement de doigt bon) is supposed to say Finger Lickin’ Good in French, although I think I might have said Licking of Good Fingers instead. I like that phrase better anyway. Go forth, make healthy choices, and lick good fingers. All three of these winter squash and pumpkin varieties were in my recent CSA delivery box. I liked the way the sugar pumpkin looked so I positioned it as the star in this photo (roasted pumpkin recipe below). I threw the kabocha squash on top at the last minute, mainly to add a splash of green to the photo. As a “food” person, I’m almost embarrassed to say I had never made anything using kabocha squash before. Silly girl. One shot at making kabocha soup and I’m totally in love with this sweet, rich, and creamy squash. Seriously, this soup tastes like it’s made with sweet cream and butter — all because of the squash. What a wonderful find for my dairy-free (most of the time) lifestyle! I’m on a mission to use every item I receive in my CSA share, no wasting organic veggies, no buying stuff at the market. So, I’m making things up and experimenting and using other recipes for launching pads and substituting with whatever is in my weekly harvest box. Last month I did a post on the nutritional value of pumpkins and said I had no desire to actually deal with them — that I would just use the canned stuff. I totally take that back! Forget I ever said it. I used my sugar pumpkin from Grant Family Farms and it was so good, I am forever converted. I’m committed to fresh pumpkins from here on out. This is SO much fun. When your ingredients are wholesome fresh veggies to begin with, you can’t go wrong. I’ll give you a brief rundown of the nutritional value of kabocha squash and get right to the recipe; if I can remember what I did. It doesn’t matter. You can’t mess it up (famous last words). 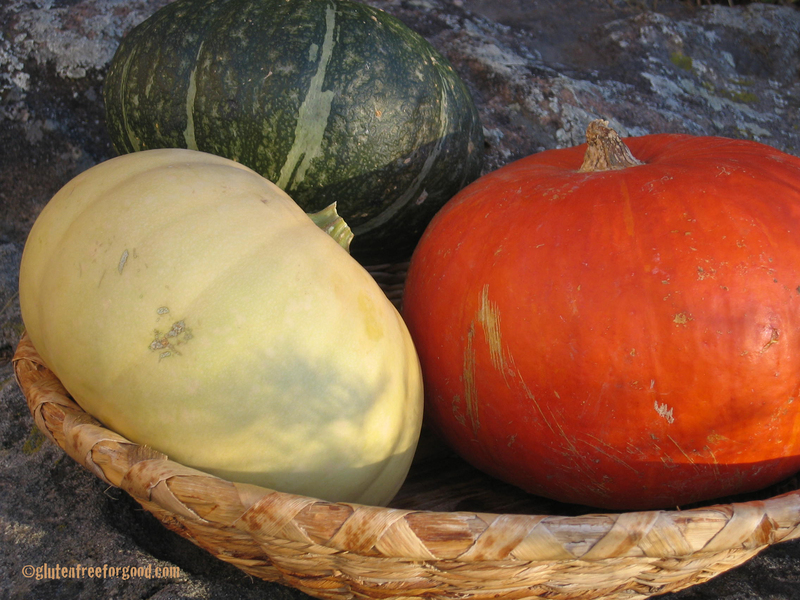 Kabocha is the generic name for a Japanese variety of winter squash. They taste a bit like a cross between a sweet potato and a pumpkin. One cup has only 80 calories, but is packed with vitamin A (145% DV), vitamin C, potassium and fiber. It’s also a good source of manganese, folate, omega-3s, and B vitamins. All good stuff. These things are pumped full of antioxidant richness. I peeled and chopped the squash (see below) before cooking it because that seemed like the best way to make soup, but some sources I read also suggested baking it with the skin on and then eating the skin as well as the meat. Apparently the skin gets nice and soft and tastes great. I’ll try that next time. Or if you’ve done that before, let me know how it worked out. Put the garlic, onion, and squash in a large pot. Add enough broth to cover the squash, put a lid on it and simmer and steam until it’s nice and soft (about 20 minutes). Mash with a fork or potato masher, add the rest of the broth and mix well. (You could also zitz it up in your food processor or blender.) Let it cook on low for 30 minutes or so. Add spinach and cook for another 3 to 5 minutes. Season with salt and pepper. Once you ladle it into a bowl, you can add some crumbled cheese (feta, goat cheese, or mozzarella) and cilantro on top for garnish. YUM! Preheat oven to 425 degrees. Put pumpkin chunks in a large bowl. Combine oil, syrup, garlic, red chile pepper, salt and ground black pepper in small bowl and whisk well. Pour over pumpkin and toss gently to cover. Depending on how big your pumpkin is you might need a touch more oil and/or syrup. You want it lightly covered, not drenched. Spread out on rimmed baking sheet and roast in oven for about 20 to 30 minutes — until tender (I like it a little firm, not completely soft and mushy). Toss once or twice while roasting. Serve as a side dish. I made a big pan of this, served some for dinner and saved the rest in the refrigerator for mixing into a fresh green salad the next day. It was awesome! Go forth and play with your food! No, I don’t have the answer to which came first — the chicken or the egg. But I do know I love eggs. And because I enjoy my CSA egg share delivery (I also get veggie and fruit shares) from Grant Family Farms so much, I decided to do a post specifically on eggs. I’m into week 21 of this year’s 26 week CSA harvest and I’m already starting to freak out about Josh and the gang ditching me for the winter. Okay, so I understand (sort of) how hard these farmers work and I understand (sort of) how they endure long days and erratic and volatile weather and I understand (sort of) how much they deserve a short break — but what about me? What am I going to do when I don’t have my weekly delivery? How will I get by for the other 26 weeks of the year? Okay, okay. I’ll get a grip and suffer through the long winter without you, Josh. And in the meantime, I’ll appreciate and enjoy the abundance of incredible veggies, fruit, and eggs I’m receiving right now. Oh my gosh, the kabocha squash (Japanese pumpkin) from last week was amazing (kabocha bisque recipe to follow in my next post)! Those of you out there contemplating joining a CSA, run right now and do so. Hurry, hurry, hurry! Opening my big red box of produce on Thursday evenings has become the highlight of my week. Yeah, I know, I have a very boring social life. If eating fresh, local, straight-off-the-farm, organic food isn’t enough to tempt you, think about the positive impact this lifestyle has on the environment. Most food travels an average of 1500 miles before it lands on your plate. By joining a CSA and supporting local farmers, you are not only enhancing your own health and the health of the ecosystem, you are also building a relationship with the people who grow your food. For more information on CSAs, small farms, and sustainability in Colorado, please refer to the articles and links listed at the end of this post. I’m a nutrition therapist, so health is my business. I also have celiac disease, which is a genetically predisposed autoimmune disease. I know first-hand how important it is to nourish your body and boost your immune system with healing foods. There’s no better way to do this than to eat a variety of fresh, organic vegetables and fruits. Oh, and eggs, too. Colorful ones — and no I didn’t dye these. The eggs pictured here are from the chickens at Grant Family Farms. 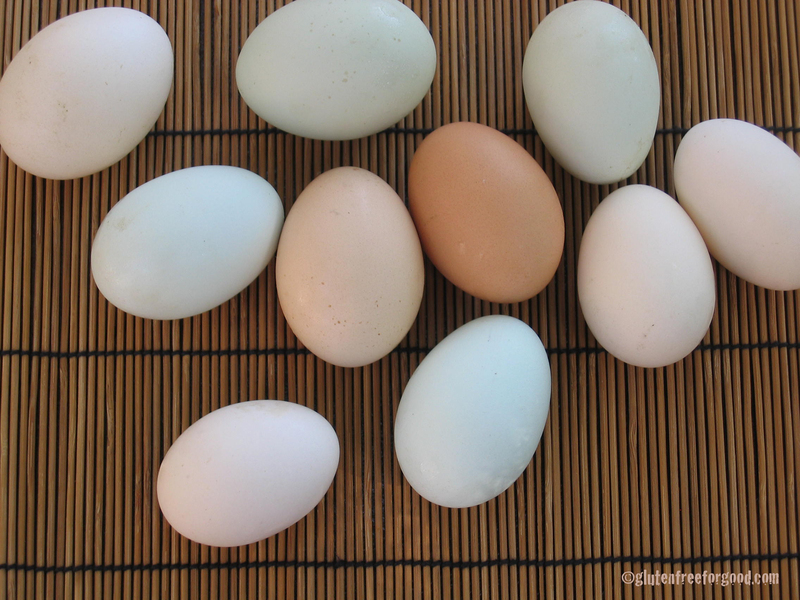 Different breeds lay different colored eggs. Farm fresh eggs from free-range chickens also have much darker, orange-colored yolks that even look heartier and more substantial. And they are. Chickens that eat a varied, natural diet produce more nutritious and tastier eggs. The chickens are happier and so are we. There’s been a long running debate about the frequency of egg consumption and the increased risk of heart disease. People have been shying away from eggs because of a fear their cholesterol levels will go up. I’ll give you my take on it, but first and foremost, if you have concerns about cholesterol, heart disease, and eggs — please consult your health care practitioner. I’m not a doctor and I don’t have low cholesterol levels, so you’ve been warned. There are a variety of studies that have shown no connection between egg consumption and heart disease. In fact, one recent study published in the European Journal of Nutrition suggests 2 eggs per day could actually help LOWER cholesterol levels. Eggs have been given a bad rap. It’s the junk food, highly processed foods, hydrogenated and trans-fats, stress, lack of exercise, and an occasional contrary gene that contributes to heart disease, not the misunderstood egg. Eggs are one of the best sources of quality protein available. In fact, eggs contain all the essential amino acids and are used as the reference standard to measure other sources of protein. One egg has only 75 calories and is an excellent source of choline, riboflavin, folate, lutein, zeaxanthin, and vitamin D. Lutein and zeaxanthin contribute to eye health and help prevent age-related eye degeneration. Eggs also contain Vitamin A, Vitamin E, Vitamin B6, Vitamin B12, thiamin, calcium, potassium, phosphorus, magnesium, iron, iodine, and zinc. All for a measly 75 calories. The egg is definitely a nutrient-dense super food. So, if you want an inexpensive and low calorie way to boost immune function; support bone and muscle tissue; promote healthy thyroid function; and encourage brain, heart, and eye health — make eggs part of a healthy diet. Now, one little minor thing about eggs — they’re considered one of the eight major food allergens. Although adults can have allergic reactions to eggs, it’s more common in children. Signs and symptoms include skin rashes, hives, nausea, vomiting, and respiratory problems. Avoid eggs and egg products if you have a known allergy to them. Go forth and eat eggs.